Indonesia’s most populated island, Java has double the population of the UK with only about half of the space. That said, Java is filled with adventurous things to do and is slightly off the beaten tourist path compared to its more popular neighbour Bali. 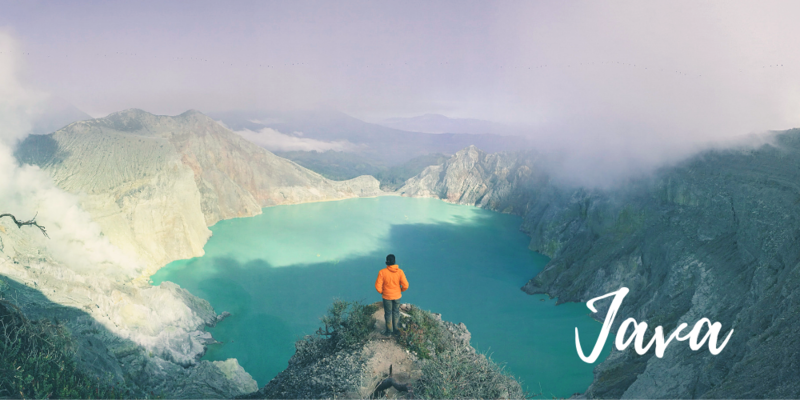 From active volcanoes and wildlife parks to stunning temples and a vibrant Muslim population, you’ll never run out of adventures in Java. Whether you’re looking for an active or cultural adventure, you’ll be sure to find it on Java island.Famous for its mountains, craters, and national parks, East Java is less populated than Central and West Java. You can enjoy a fantastic sunrise at the famous Mount Bromo, which is just a short trip away from East Java’s capital, Surabaya. If that’s not enough, try summiting Mount Semeru, the highest mountain in all of Java. For those that want a cultural adventure, be sure to head to Central Java. This area is home to the famous Borobudur Buddhist site as well as Prambanan, a stunning Hindu shrine. The whole of Java is also home to a primarily Muslim population, which is a great chance to explore a distinct aspect of Indonesian culture.